Some spoilers below for Mamma Mia! Here We Go Again. 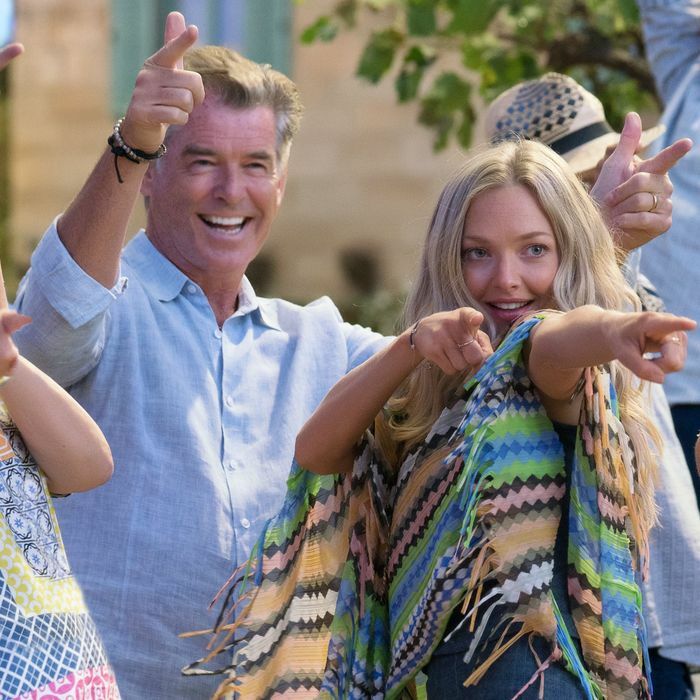 The Mamma Mia movies — yes, there are two now, and don’t you forget it — might be the epitome of blue-sky cinema. The first one was based on the hit musical (which was itself based on a rosé fever dream of an ABBA Greatest Hits collection,) but transposing its simultaneously libertine and trippily conservative story line to film form, it didn’t merely feel like a West End import. The postcard-perfect Greek isles location and plethora of respected actors sporting their holiday tans hailed from very specific kind of light viewing bubble. Here We Go Again replicates that exact same feeling ten years and one or several economic collapses later, a feeling only revved up by the almost complete absence of Meryl Streep and the addition of Cher. It’s so adamantly blue sky that even its night scenes and a pivotal storm scene are obviously shot day-for-night, but even when the script requires it, no abundance of filters and digital effects can mask the indefatigably great weather. Here We Go Again is a prequel-sequel hybrid, though there’s not much in the way of plot to either of its timelines taken separately. In flashback, we see the romantic oat-sowing events leading up to the mystery pregnancy that fuels the plot of the original, with Lily James playing the young Donna. In the present day, Donna is dead (!) and Amanda Seyfried’s Sophie is reopening her mother’s villa as the Hotel Bella Donna, an endeavor that is somewhat soured by her husband Sky’s (Dominic Cooper) absence and some inclement weather. That’s basically it. The main twist is that, having exhausted most of the most universal ABBA hits in the original musical, writer Catherine Johnson and the rest of the filmmakers must dig deeper in the crates, and do contortions around less instantly recognizable fare. But the selections end up being more Broadway-esque hits than much of the original’s soundtrack, perhaps more believable as show tunes than “Gimme! Gimme!” or “Dancing Queen” (the latter of which of course gets a reprise here). There’s a particularly nice soliloquy that James has upon discovering the villa that would become her home, set to “I Have a Dream,” a vastly underrated ballad that slots in perfectly as a home-renovation anthem. James, who is working incredibly hard from start to finish, sells it as well as she sells every other absurd musical set piece, from a Napoleon-themed rendition of “Waterloo” performed with future Colin Firth Harry (Hugh Skinner) and the waitstaff of a Parisian café, to the opening number, in which she and her girl group the Dynamos (played by Alexa Davies and eerie Christine Baranski look-alike Jessica Keenan Wynn) take over their college graduation to “I Kissed the Teacher.” She’s not really acting here so much as giving musical face, but she’s a natural at it; there’s never a moment the camera catches her failing to sell a number with all her heart. As a young flower child traipsing and/or sleeping her way around Europe, Donna is the ultimate carefree white girl™ on paper, but James makes that label enviable in the exact way it’s supposed to be. Perhaps it’s because she knows that no matter how much she pours into the role of young Donna, she’s doomed to be upstaged in the final moments, first by the double threat of Cher as Donna’s mother, and none other than Andy García as the groundskeeper from her past who happens to go by the name of Fernando. Their number together is simultaneously phoned in and outlandishly weird; it is abundantly clear that García’s contract stipulated that he would not be asked to do anything that could be mistaken for dancing. But the emotional cake goes to a certain Oscar-winner’s return from beyond the grave for the last number. In a disarmingly great sequence, Here We Go Again ties up these two wackadoo films’ hijinks in a very sincere bow. After all, Mamma Mia is a mom movie, in every way imaginable.